Last week Simon Norfolk’s When I am Laid in Earth was announced winner of the landscape category for Sony World Photography Award. 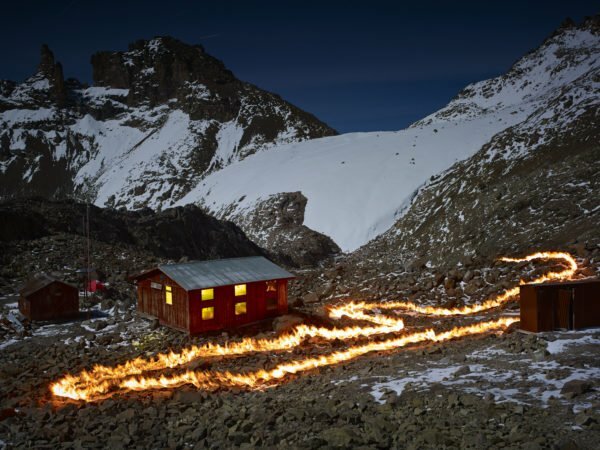 His winning piece depicted an impression of how climate change has affected Mount Kenya’s glaciers. It is Norfolk’s first contribution to the Project Pressure archive and relied on data provided by the Project Pressure team. The data and glacier outlines were sourced, in part, from peer reviewed articles published over the last 50 years. Useful maps were identified within journal articles and the authors were contacted so the relevant first and second hand information could be retrieved. Further information was drawn from the Mount Kenya glacial records held at the National Snow and Ice Data Center (NSIDC); and from the Global Ice Land Measurements from Space (GLIMS) database, which provided current GPS information. Through this methodology it was possible to pinpoint historical glacier outlines onto GPS devices. This allowed Norfolk to track the previous glacial extents. In utilising a dramatic juxtaposition alongside a simple message Norfolk produced highly potent artwork; creating a powerful tool for communicating climatic and glacial data and raising awareness regarding the impacts of climate change. When I am Laid In Earth was originally featured in The New York Times Magazine last December. Check out our earlier posts for links to the full series and the behind the scenes video from the expedition.